Ja-bu-go. Three syllables that resonate for gastronomy enthusiasts around the world. For us here at Cinco Jotas, these three syllables symbolize what makes us who we are: tradition, nature, and history. Jabugo is all this and so much more. 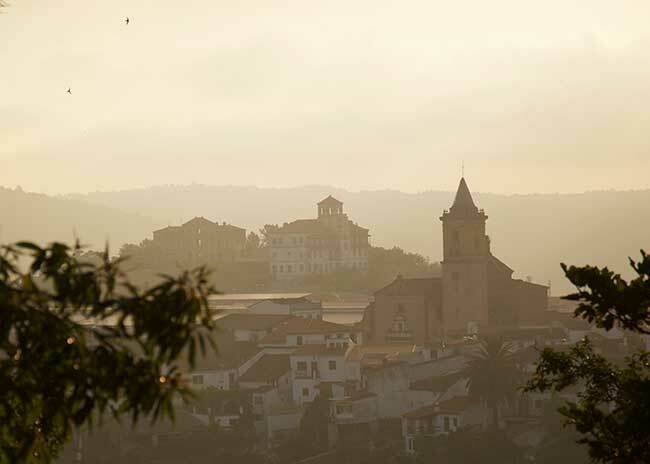 Located inside the Natural Park of the Sierra de Aracena and Picos de Aroche (Huelva, Andalusia), the 3,000 inhabitants of Jabugo have a distinct connection with Iberian ham, and Cinco Jotas. It was in 1879 when the local entrepreneur Juan Rafael Sánchez Romero opened our first slaughterhouse and curing cellar in Jabugo that would become the very foundation of our brand. Visitors to Jabugo can sense right away the importance of Iberian ham to the daily life of the locals here. Many are attracted by the famous name, which they quickly relate to our unique product. When these visitors make the decision to explore our curing cellars, they are in for a real treat. They are amazed at the singular experience of Cinco Jotas, the profound history behind the 100-year old curing cellars, the unique environment, and the artisan process that goes into creating our indulgent acorn-fed 100% ibérico ham. The climate of Jabugo is essential for Cinco Jotas. Our curing cellars and our local meadows (dehesas in Spanish) can’t be replicated in any other location. This spot is 650 meters above sea level and has a perfect microclimate for breeding Iberian pigs and curing hams: summers with temperatures between 25 and 30 ºC maximum, winters with minimums of 5 ºC, and annual average temperatures that don’t exceed 17 ºC. The autumn and winter seasons are cool with abundant rains, but without any harsh ice and snow. Our curing cellars are located at the highest points of the local mountain ranges, where they are exposed to vibrant, cold northern winds. Cobble-stoned streets, traditional White-washed buildings and a perpetual sense of tranquillity. This is Jabugo, the only town in Spain whose main square, the local meeting point, is called “Plaza del Jamón” – Ham Square. A tribute in every way. 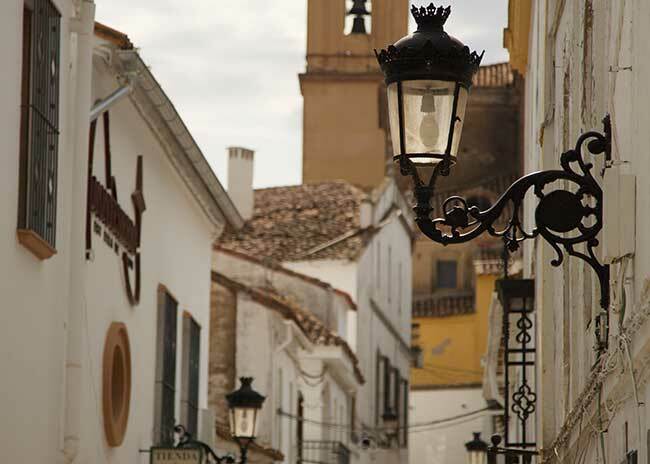 After discovering Jabugo and enjoying a visit to the Cinco Jotas curing cellars and the surrounding meadows, visitors can enjoy exploring other stunning towns in the Sierra de Aracena region. Castles such as the Almonaster la Real, the only one in Spain that boasts a mosque; the secluded streets of towns such as Fuenteheridos and Alájar; and a distinct must-see: the caves, or grottos, of the Maravillas in Aracena, including the opportunity to stroll along 2 kilometres of beautiful nature, tunnels and lakes.